Mode of occurrence: Small fragments of irregular nodules. Cortex: Worn, thin (1 mm) and slightly rough, highlighted by a recrystallization front; transition sharp. Colour: Olive grey (5Y 4.4/1). Pattern: Featureless, rare small white spots. 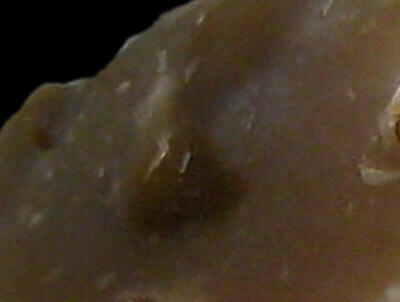 Appearance: Very homogeneous material with a greasy lustre, subtranslucent, smooth and fine-grained. Grains: 2.5 %, pale, rounded with high sphericity, well sorted (100 and 400 µ). Grain composition: Globose planktonic foraminifera (often surrounded by a halo of recrystallization), a biserial foraminifera (Heterohelicidae), rare sponge spicules; traces of iron oxides. Further information: Click here for the original French description (opens in a new window), or here for more information on the attributes used in the description (use your browser's "BACK"-button to return here). Citing: Information on citing this page can be found here. Geographical description: The sample was collected along the small road which connects Solomiat with the main D 979 road, some 350 metres to the southwest of the village. Co-ordinate precision: The Lambert reference given was taken from a large-scale map, and are within approx. 50 metres of the actual spot. The latitude/longitude coordinates are a direct transformation of these data on WGS84 and are accurate to the same level, so don't be deceived by the apparently high precision to the second. The location can be found on the 1:25 000 topographical map sheet 3229 W of the French Institut Géographique National. Geology: According to the geological map, the substrate belongs to unit Rs, which represents clays-with-flints, in this case presumably the residual of unit C6 (Late Cretaceous, Senonian) limestones. Map of all sampled localities of Late Cretaceous flint in the Bugey (PDF, 54 KB, opens in new window). 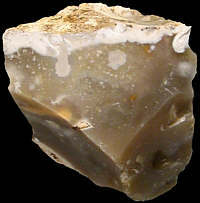 Other types of flint: Besides the CN5 material, flints of the CN2b and CN4c type (both of similar age) might be found here.